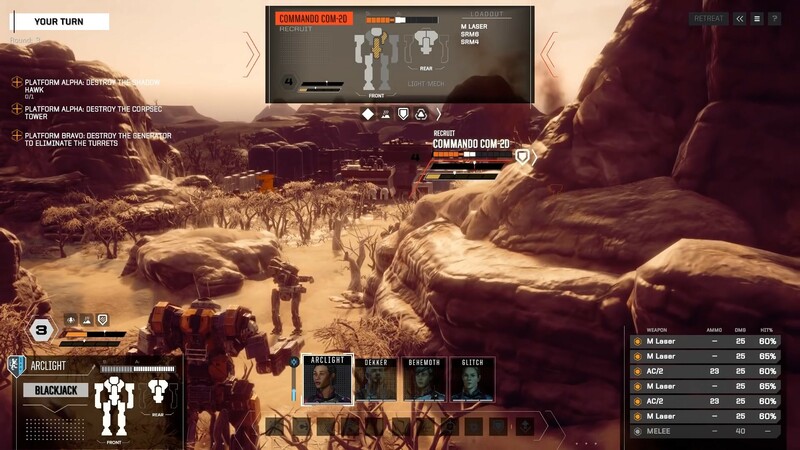 In the latest backer update developer Harebrained Schemes have shared some notes about the current state of BATTLETECH [Official Site] and their plans going forward. They haven’t put out a firm release date for the game yet but they’ve gone ahead and stated what they have already cut from their intended release version. Sadly, this means that Linux won’t be there day-1. I’m not too surprised about this as, when the previous backer beta test failed to have a Linux version, I suspected that we weren’t much of a priority as a target platform. Harebrained Schemes has been good with supporting Linux in the past, with their Shadowrun titles all making it our way, so I’m confident we’ll get the game eventually. This is likely a decision made with a mind to limited developer man hours and resources. That doesn’t make it any less disappointing, especially as I’ve been a fan of the BattleTech franchise for a long time and was looking forward to seeing soon what one of the original creators, Jordan Weisman, would think up for this new game. Other things have also been cut or altered, including having only a limited skirmish mode at launch and some of the bonus content unlocked during the Kickstarter campaign. Save for Ironman mode (one save file allowed, automatically saved), these items primarily add flavor rather than have a fundamental impact on gameplay. Like with Linux support, it’s planned to add these things to the game somewhere down the road. The biggest change in the announcement, however, is about how multiplayer is structured. BATTLETECH will no longer focus around competitive leagues and tournaments, instead opting for a more friends-focused approach. Personally, I’m fine with that, not really being into competitive multiplayer and I’d rather they get the basic balance just right first before potentially going down that road. They've mentioned that players on both GOG and Steam versions will be able to play friends and join public games from their game client. I hope that whenever they announce a release date, they do us a courtesy and outline just how long Linux gamers will have to wait to get their hands on the game. Seems like they've had a lot of difficulty with it. Meh. Massively disappointing with this too, was looking forward to it myself as well. Glad I didn't back it. Quote They've mentioned that players on both GOG and Steam versions will be able to play friends and join public games from their game client. Well , you can't on GOG version because there is no platform equality on GOG. It's....difficult, not to be disappointed here. Some of the wording is setting off alarm bells for me, which I'll note down here but should stress that with nothing out, these are concerns only of what _might_ happen. GNU/Linux being dropped for launch just makes me think of all the games that say "it will come later", and....it never does. Or far too late to be worthwhile. If they want to focus at all on multiplayer (and honestly, I hope they do put the effort into a campaign first & foremost), then GNU/Linux players will be late, last, if at all to the party. Which ultimately hurts sales. As a side effect - we've all seen then how "oh, we didn't know about problem X with middleware Y". And "need to finish and polish the game before focusing on GNU/Linux support" (because digital artists touching up things somehow means systems programmers can't do their work). Battletech is made to provide DLC really. Talking about features being delivered post launch...let's hope they don't get greedy and go too far. I've every reason to think they won't, but the wording just starts to remind me of bad things having been seen of late. I know I sound really negative. That's an impact of having seen this sort of news far too often, not (solely) directed at hairbrained schemes. Knowing this might happen was the #1 reason I didn't back the game - and oh what a surprise. I do hope they get their stuff straight and deliver it on linux sometime! This looks great, I would love to play this. A general tale of warning against relying on Steam multiplayer integration. This vendor lock in trap has prevented some number of titles such as Disco Dodgeball from being brought to GOG due to complications with multiplayer compatibility. Sounds like a scope vs cost issue. The game looks bloody amazing, and they likely have a lot to do before release hence trimming back features. Once they release and start getting a steady stream of income from it I'll bet they implement the original goals. Been through this song and dance too many times now. I won't be holding my breath for this one. Quoth the Raven "Nevermore I am buying game that is just 'supposed' to come to linux. Next time I will wait for full release. And sale."